You are cordially invited to attend Bazm-e-Sarfraz, CMSS’s annual event commemorating the contributions made by Begum Sarfraz Iqbal (1939-2003) towards promoting Urdu literature and championing the cause of inter-communal harmony. 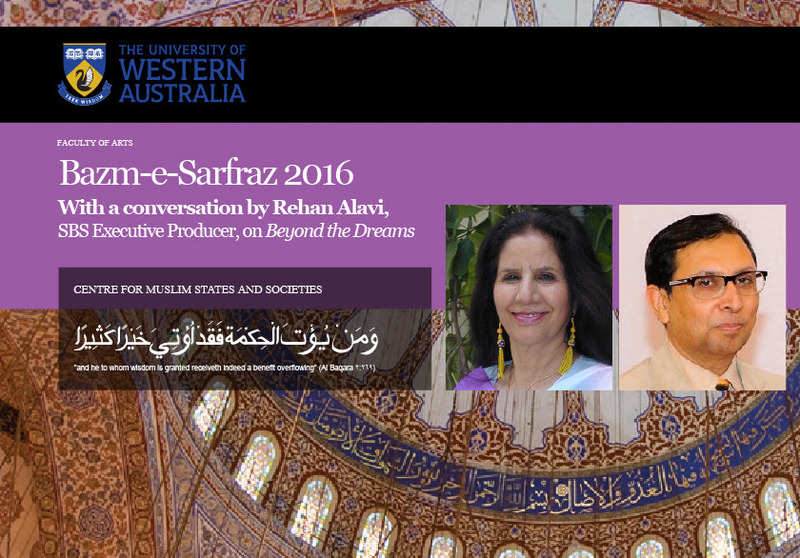 At this year’s event, Mr Rehan Alavi, prominent author and Executive Producer at SBS Radio, will have a conversation on his book, Beyond the Dreams, followed by Q & A and dinner. Rehan Alavi has been writing fiction for more than two decades. He came across thousands of real-life stories during his career as radio Journalist/executive producer at SBS Radio since he migrated to Australia sixteen years back. Rehan has contributed articles and blogs to a variety of magazines and written many short stories. Several of his popular fictions are published in literary magazine. Beyond the Dreams is highly acknowledged as a great contribution towards harmony and moderation. This unique work is a celebration of literary contribution of migrant community and acknowledgment of diversity of Australia. The book was launched by Oxford University Press during the three day International Islamabad Literature festival (ILF) 24-26 April 2015 and launched by the Australian High Commission during Australia day in spring celebrations in Pakistan in April 2015. Born in Rohtak, India, Begum Sarfraz Iqbal migrated to Pakistan at a young age and became a patron of Urdu literature and art in Pakistan. She authored two books: Daman-e-Yusuf (Mavara Publishers, 1989) and Jo Bachay Hain Sang (Naqoosh, 2002) and wrote regular columns in Daily Ausaf (Islamabad) and Daily Pakistan. She also published numerous articles in other literary magazines including Mah-e-Nau. Begum Sarfraz Iqbal was a philanthropist who introduced the idea of adopting schools to improve the quality of education in Pakistan and ceaselessly worked to help disadvantaged people in Pakistan. The events commemorating her contributions focus on ideas that unite people across religious and cultural divides and focus attention on ideas and philosophies of moderate Muslim thinkers.